Fairfield Ludlowe's Jack White races during the 800-meter race at the New England Interscholastic Outdoor Track & Field in Saco, Maine on June 9. For two years at Fairfield Ludlowe Jack White was a football and baseball player. But after his sophomore season -- a year in which White toiled in both the Falcons' football and baseball programs -- his track coaches suggested a full year of running could make him a special athlete. 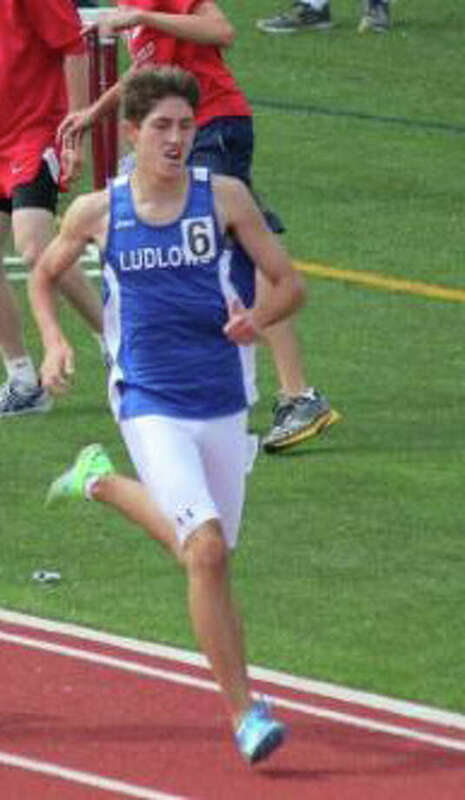 The senior finished fifth at the New England Interscholastic Outdoor Track & Field meet in Saco, Maine in the 800-meter race, his final race at Ludlowe. "I was really happy finishing off so well," White said. "I traained hard and was shocked by how well I did." White will continue his running career at Tulane University, where he'll run both cross country and outdoor track. White chose Tulane over Penn State and Villanova. "It gives me the best chance to run right away," he said. But for two seasons, White played safety in the fall, pitched in the spring while running indoor track in the winter season to stay fresh for both. Yet, when White quit football and baseball to concentrate solely on running, he and his support group were torn. "There were some friends and parents who asked `what are you thinking,'" White said. "But track is so unknown, so many people don't understand what it means to run a two-minute, 800 (meter). But I made the right choice." It was a possibility suggested by Nulf and girls coach Amanda Parrish. .
"I tried to convince him it was a good idea," Nulf said. "I didn't say `you should do track over baseball,' I just said that he was pretty good at it." "I saw a sport where people actually wanted me to do it," White said. White had a successful junior running year, and without football or baseball to train for, his progress was not stunted. "It would've been tough," White said when asked whether he could've achieved his level of success while playing football and baseball. " This led to his dominant senior season. Most importantly, White dodged sickness and injury in all three 2011-12 seasons, starting in the fall, where his 33rd-place finish at Class L cross country meet was tops of all Falcons. "It was great that he was able to stay healthy and stick to the training program," Ludlowe boys track and field coach Dave Nulf said. "We knew he had a chance to have a special year." White then followed up the Falcons' first-ever FCIAC Central Division championship-- and the FCIAC indoor meet where he finished seventh in both the 1,000-meter race and as a leg in the 1,600 sprint medley relay-- with an impressive 2012 indoor season. White won the 1,000 at the Class L meet, then placed third with John Grant, Andrew Fernandes and Jordan Filipowich. "(College coaches) wanted to see how I would do my senior year," White said. "It gave me motivation and I ran great times." With Wynne participating at Class LL, White dominated the Class L field, placing first in the 800 with a 1:57.33-- nearly three seconds better than second place. At the State Opens, White's 1:55.18 was good enough for third. The Ludlowe senior overcame the exuberance of racing at the state's biggest level, and the field, running neck-in-neck with Wynne until the final 100 meters. "Opens was the most nerve-wracking," White said. "I had a great first 400 meters...the race went exactly how I pictured it in my mind." His third-place finish earned him a date in New Englands, where the 800-meter race had some bizarre twists. White's fifth-place finish, according to Nulf, was a remarkable accomplishment. Much of the field false-started, then a pile-up, caused by a fall, slowed the race's pace. "It was a weird race," Nulf said. "It was difficult conditions." Despite his relative struggle at New Englands, White's participation at New Englands was gravy. "I didn't want to waste time getting nervous," he said. "I just wanted to go out there and have a great race." White is one of Ludlowe's top racers ever, and Nulf realizes how special he has been to the Falcons success. "He's been part of a group of kids who are committed," Nulf said. "His competitiveness is contagioius and the kids coming back will carry that on."